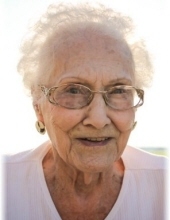 Ruth Virginia Rogers, 102, of Cygnet, Ohio passed away Friday November 23, 2018 at Wood Haven Health Care in Bowling Green. Ruth was born July 10, 1916 in Cygnet to Clarence and Clara Belle (Errett) Sterling. She graduated from Liberty High School in 1934. She then graduated from Warners Cosmetology School in Toledo. Ruth worked at various restaurants in Toledo including Granada Gardens. She worked as a mule driver at Spicer Manufacturing in Toledo during the war. Ruth enjoyed traveling the world, embroidery, crocheting, puzzles, crosswords, auctions, flea markets and volunteering for the Wood County Hospital Guild and nursing homes. She also helped with the Red Cross blood mobile. Ruth was a member of Eastern Star 341, Toledo and Mt. Herman Church. Ruth is survived by her son Douglas Sterling Rogers, California, and grandchildren Steven Rogers and Terry Ann (Doug) Earnhart. She is also survived by her great-grandchildren Ashley, Austin, and Evan Earnhart all of California, niece Faye (John) Duber, nephew Dean (Pat) Bowler and great-nephews Timothy and Michael Musil. She was preceded in death by her parents, sister Kathryn Bowler and daughter-in-law Linda Rogers. A Graveside Service will take place Thursday November 29, 2018 at 1:00 p.m. at Wingston Cemetery in Rudolph, Ohio. Dunn Funeral Home is handling arrangements. Memorial contributions may be given in her memory to the Wood County Humane Society. To send flowers or a remembrance gift to the family of Ruth V. Rogers, please visit our Tribute Store. "Email Address" would like to share the life celebration of Ruth V. Rogers. Click on the "link" to go to share a favorite memory or leave a condolence message for the family.